You are here: Home / Lifestyle / Mango is the way to go this summer! Summer is the season of Mango. I am yet to meet someone who doesn’t relish the king of fruits. It can be eaten in any form, any time of the day and can be made into a lot of mangolicious recipes. In honor of this great summer fruit, I present you some quick mango summer recipes guaranteed to tingle your taste buds. Quick to make, with minimal ingredients and super yummy! There is nothing more pleasurable than digging into a bowl of chilled dessert especially a fruit based one like mango. Heavenly on hot summer day! In a blender add 2 cups of ripe mangoes along with 1/2 cup milk and make a smooth puree. Transfer to a bowl and set aside. Place 5gms agar-agar along with water on low heat and keep stirring till the agar-agar is completely dissolved. Bring 1/2 cup milk to a boil along with ¼ cup sugar and a pinch of cardamom powder. Simmer on low flame for 3-4 minutes. Add the agar-agar mixture and keep stirring on low flame for 4-5 minutes. Turn off heat and allow cooling. Add the mango puree to the agar-agar mixture and mix well. Pour the mixture into serving bowls. Allow to sit at room temperature and cover with plastic wrap. Place in the fridge for at least 3 to 4 hours. Garnish with mango pieces and serve chilled. Take 1 cup ripe chopped mangoes, preferably Alphonso variety in a blender. Add ¼ cup milk and ½ cup sugar. Puree the mixture until you get a smooth paste. Pour this mixture into Popsicle moulds and cover them with clean wrap. 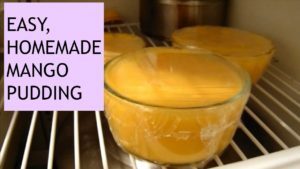 Arrange the moulds in a freezer and freeze until firm. An alternative to Popsicle moulds are paper cups. Pour the mixture into small paper cups and let them set in the freezer. When they are set halfway, insert ice cream sticks and then let it freeze until firm. Another alternative is the usage of ice cube trays. Although you would get small size popsicles, still it is the best way to beat the heat. 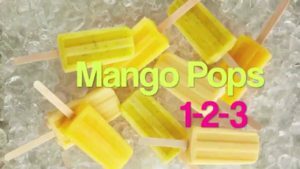 Once the popsicles are set, run the mould under room temperature water for a few seconds to loosen the mango popsicles from the mold. Serve immediately. You may also like: Sleep elusive in summer for you? Here are some remedies for you! Place three mangoes along with water in a sauce-pan and bring to a boil. Simmer for 10 minutes. Then remove from heat. Peel the mangoes and retrieve the pulp with the help of a spoon. Grind mango pulp along with water to a smooth paste. In a pan take the pulp, add 1 cup sugar and let it cook on low flame till the sugar dissolves completely. Stir continuously. Remove from fire and add 1 tsp roasted cumin powder, black salt and salt. Let this mixture cool down. Take a tall glass pour 1 -2 tblsp of the mango mixture and top it with chilled water. Now add finely chopped mint and crushed ice. Garnish with mint leaves and serve immediately. 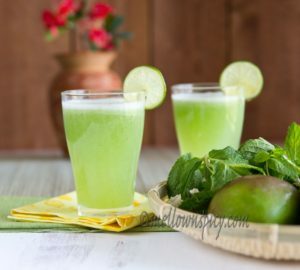 Do make these delicious drink and desserts and post your comment below! Keep watching this page. There’s more to follow!